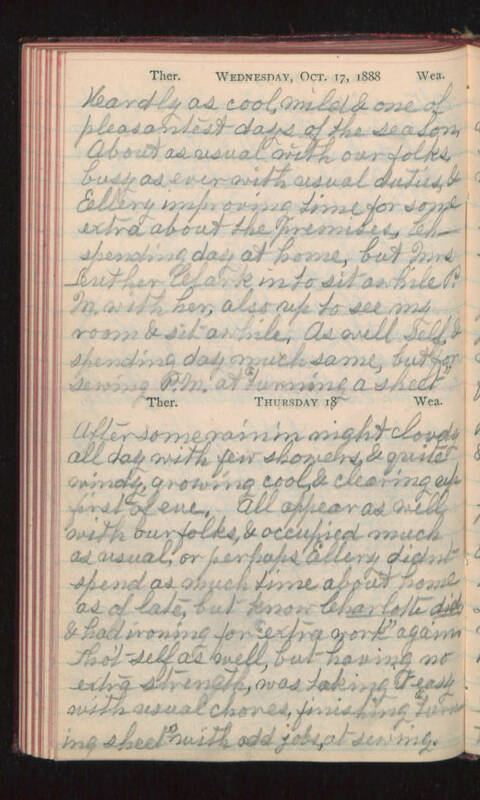 Wednesday, Oct. 17, 1888 Hardly as cool, mild & one of pleasantest days of the season. About as usual with our folks, busy as ever with usual duties, & Ellery improving time for some extra about the premises, Ch- spending day at home, but Mrs Luther Clark in to sit awhile P.M. with her, also up to see my room & sit awhile. As well self & spending day much same, but for sewing P.M. at "turning a sheet". Thursday 18 After some rain in night cloudy all day with few showers, & quite windy, growing cool & clearing up first of eve. All appear as well with our folks, & occupied much as usual, or perhaps Ellery didn't spend as much time about home as of late, but know Charlotte did, & had ironing for "extra work" again. Tho't self as well, but having no extra strength, was taking it easy with usual chores, finishing "turning sheet" with odd jobs at sewing.